What we see here is an unpainted hardcopy of the Han Solo (Bespin Outfit) action figure's right arm. Empire Strikes Back hardcopies are a lot more difficult to track down than Return of the Jedi hardcopies making this piece even more special. Take notice of the color of the arm. 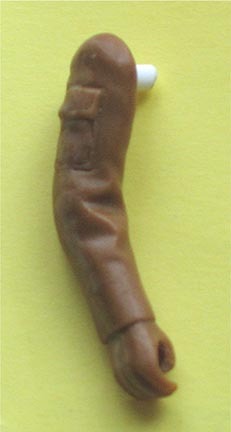 Since this is a pre-1981 action figure it was cast in a brown resin called Carbalon. Hardcopies are created in such a way so that they can be disassembled. They are normally held together with either metal or plastic dowels. As you can see this particular piece has a plastic one. Those interested in the Han Solo (Bespin Outfit) figure may also be interested in viewing an unpainted hardcopy (missing torso and left arm) and a fully painted hardcopy.